R1 PRE TRAIN 2.0 – NEW FOR 2017! Mix one (1) scoop with 8-10 oz. of cold water 20-30 minutes prior to training. DO NOT exceed one (1) serving in a 24 hour period. Total Caffeine Content: Approximately 275mg per one (1) scoop. Not for use by those under the age of 18, women that are pregnant, trying to get pregnant, or nursing a baby. pre train is intended for healthy individuals only. consult your physician before using this product if you are under a physician’s care for any medical condition or are taking any medications. pre train contains about as much caffeine as three cups of coffee. do not consume caffeine from other sources while taking this product. too much caffeine may cause nervousness, irritability, sleeplessness, and occasionally rapid heartbeat. 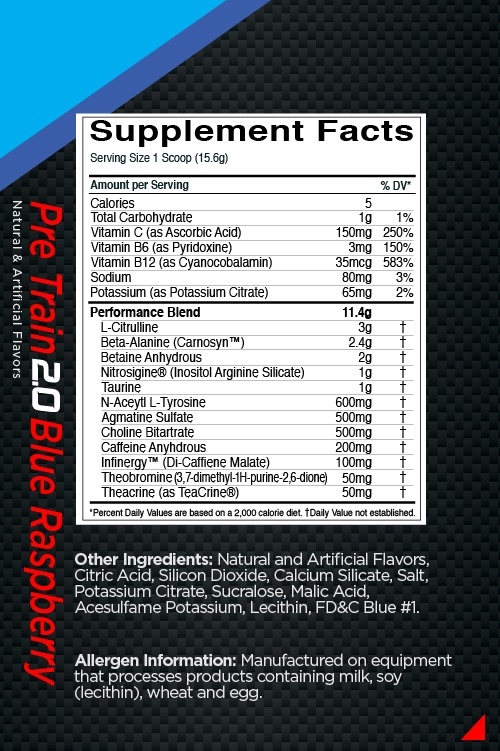 pre train also contains beta alanine which may cause a temporary tingling or flushing sensation. 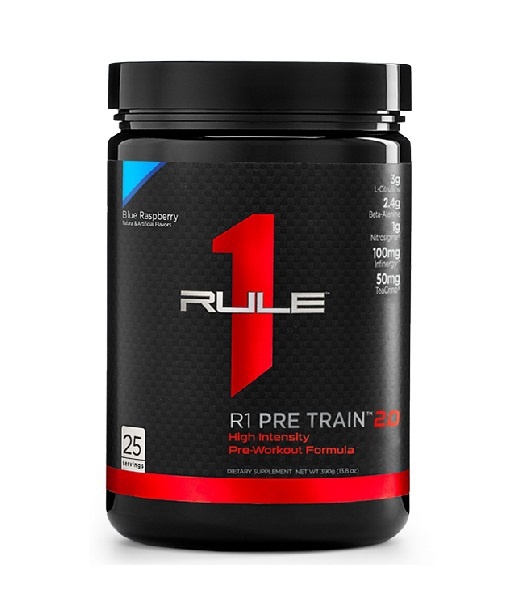 do not exceed 1 scoop within a 24-hour period or combine with alcohol. exercise may increase your fluid needs, so drink lots of water every day to stay well hydrated. consume as part of a healthy diet and exercise program. immediately discontinue use if you experience any adverse effects or unusual symptoms. CALIFORNIA RESIDENTS: WARNING: pre train can expose you to chemicals including lead, which is known to the state of california to cause cancer and birth defects or other reproductive harm. for more information GO TO: WWW.P65WARNINGS.CA.GOV. KEEP OUT OF REACH OF CHILDREN.